Maura Anderson is “one of nine wicked good women who write about magic, fantasy, and the paranormal” , and co-authors Witchy Chicks, a lively fiction writer’s group blog. In her latest short story, titled Lord of the Crows, she weaves a modern fantasy out of an old Samhain fable. “A few breaths pass, then another few in the now silent clearing. Finally a huge male figure stands up through the fog. His skin glows a midnight blue-tinged black, shiny and smooth as a ravenâ€™s breast and his long hair trails down his back as if formed of a thousand crow feathers. A mighty stretch and he tilts his head back and screams a demand, his crimson eyes bright with anticipation. First one, then two, then more and more appear. Ravens and crows alight on his shoulders and arms and whisper to him the secrets they have learned and the sights they have seen. He takes their knowledge as his due and murmurs back to them their new task, what his creatures will do in his service for the next year. 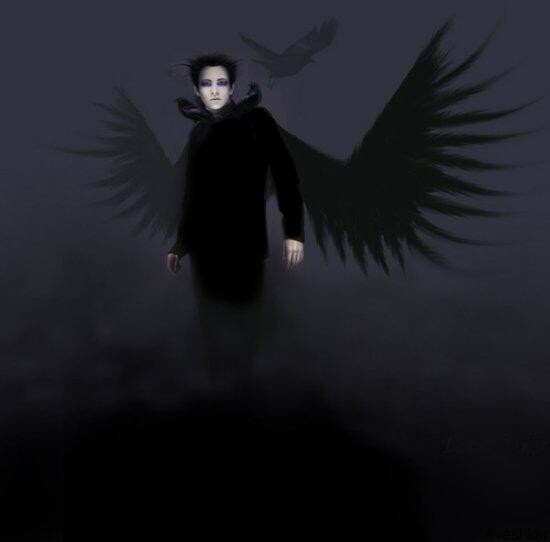 Each oneâ€™s eyes glow with a brief flash of red, then return to black as they wing their way to the next task. You can also catch up with Maura and her romance books on her personal blog, Realms of the Raven.